Accessories ~ our accessories are listed below. Veils ~ As you can see from the pic on the right, in addition to making Louise’s stunning dress we also made her full length veil. 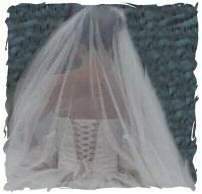 As well as making veils to measure we also carry a small stock of veils so that you can get an idea of which length / how many layers to go for. 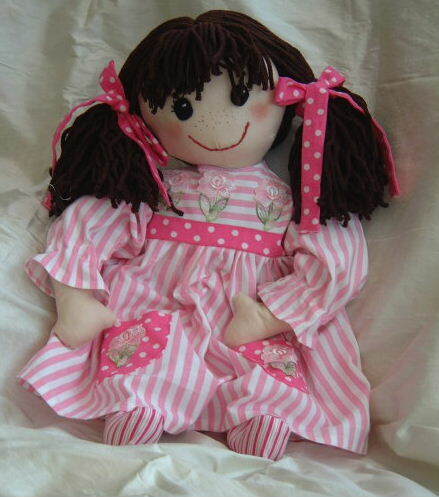 Rag Dollies ~ This lovely little handmade lady makes an absolute perfect gift for small bridesmaids or indeed something different for them to carry. The doll can be dressed in a “matching” bridesmaid dress or somthing entirely different. Either way, they always go down a treat. Stuck for that Christmas or birthday present? Then how about a gift voucher? This can be redeemed against any item of made to measure be it a wedding gown, evening dress or suit. They can be purchased in multiples of £25 and make an ideal gift. All you have to do is email us with the details of the amount you wish to spend, the recipient’s details and we’ll do the rest. We DO NOT disclose any personal details whatsoever to third parties.